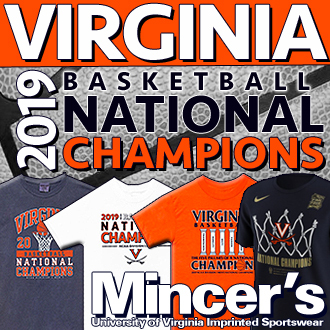 The Virginia men’s basketball program’s storybook season culminated in Charlottesville, in a memorable, orange-and-blue-clad National Championship celebration on a beautiful Spring afternoon Saturday at Scott Stadium. 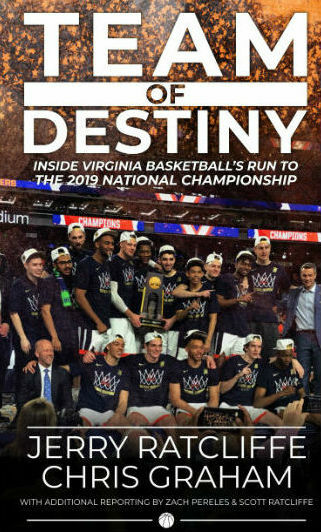 Wahoo Nation came together in full force to pay tribute to their champions as ‘HooVision provided goosebump-inducing highlight videos of the most unforgettable season in UVA history, with chants of “U-V-A!” and “Tony! Tony!” sprinkled in throughout the event. All of this on Thomas Jefferson’s birthday, no less. 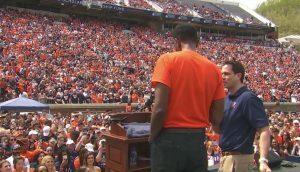 Wahoo legend Ralph Sampson got things started, referring to Virginia’s ride through the Big Dance as “the greatest story in college basketball history” and sharing an interesting tidbit with the crowd of approximately 25,000 jubilant fans. “I decided it 40 years ago,” Sampson said to an ovation, when asked when exactly he decided he would follow his alma mater all the way from Columbia to Minneapolis. 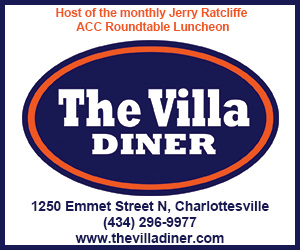 “Ironically, 40 years ago today was my official visit, this weekend, to the University of Virginia. It’s my mother’s birthday, she turns 81 today, so it was 40 years ago that I came here on my official visit and decided to go to UVA. 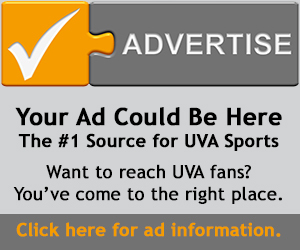 Ralph Sampson speaks to UVA fans Saturday. Sampson admitted that he wore the same pair of shoes to all six NCAA Tournament games, that he now plans to “retire” until a later date. “I’m going to wear them next year so we can do it twice,” Sampson exclaimed, which drew an even louder roar. After UVA Health System CEO Pam Sutton-Wallace, City of Charlottesville Vice Mayor Heather Hill and City Council Member Kathy Galvin shared a few words, UVA Director of Athletics Carla Williams addressed the crowd. “Charlottesville! Yeah! Let’s Go! National Champions!” Williams exclaimed, before being asked if she ever thought such a scene was possible when she took the job. Shaking his head in disbelief, and adding that the turnout was “more than we expected,” Coach Tony Bennett then led the team members onto the field, with the Championship trophy draped with remnants of the hoop in tow, and he explained how a moment on the road from earlier in the season came full circle on Saturday. 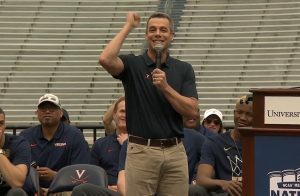 Tony Bennett pumps his fist during Saturday’s ceremony. Bennett pumped his fist with a satisfying laugh, high-fiving his players and displaying the excitement of a kid waking up on Christmas morning. 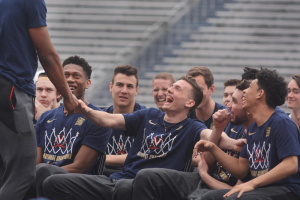 “Our theme was ‘United Pursuit,’ because we knew it would be that,” Bennett told Wahoo fans young and old, “and I can’t help but think this is a united celebration of that pursuit. I’m blown away by it. Kihei Clark and Mamadi Diakite talked about their respective roles in “The Play,” Braxton Key touched on his game-saving block at the end of regulation against Texas Tech, while Jack Salt reflected on being the lone senior, his program-record 118 wins at UVA, his future professional plans, and most of all, the memories. De’Andre Hunter admitted that he didn’t play his best basketball throughout the tournament, but explained that he knew he had to step up and be aggressive when it mattered most, including his 3-pointer late in regulation that sent the title game to overtime. 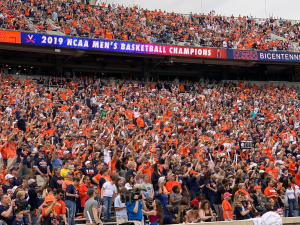 Final Four Most Outstanding Player Kyle Guy told the fans about the pressure-packed moments leading up to his game-clinching free throws against Auburn. Jerome pointed out where he got his motivation to help lead the program to its first title. 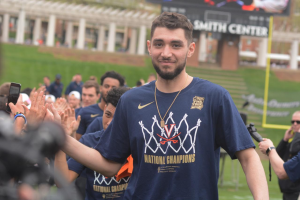 Cavalier redshirt-freshman forward Francesco Badocchi showed off his piano skills and brilliantly put the finishing touches on the ceremony with his rendition of “One Shining Moment” before the famous song was played along with the championship highlight reel on the big screen. Upon exit from the stage, Bennett and his players could be seen high-fiving and taking selfies with fans as “The Good Old Song” rang on the speakers to put a perfect cap on this memorable day and championship season. NOTE: If you missed any of the celebration ceremony, or just want to watch it over and over again, click here.